Any of various devices having two jaws, closing by a screw, lever, cam, or the like for holding work. This clothespin vise meets all of the requirements of this definition. The ends of the clothespin have been cut and sanded at a 45 degree angle. Each prong of the clothespin becomes a jaw in the vise. A hole is drilled along the centerline ½ an inch from the sanded edge. A 3/16 diameter eyebolt is placed though the hole with a washer on each side of the clothespin to reduce the occurrence of splitting of the prongs of the clothespin. A wing nut is provided to compress the jaws and to hold the hook. The jaws of the clothespin vise have a short life. Splitting of the jaws is common when clothespins are used. Splitting is less frequent when hardwood dowels are used in place of a clothespin. 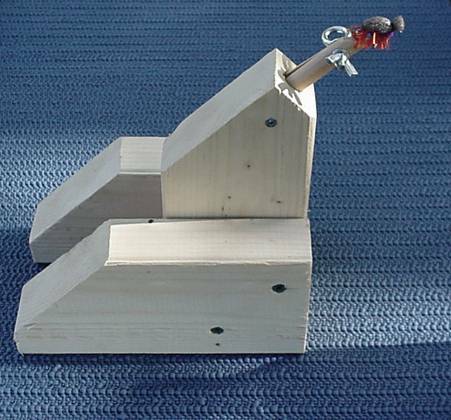 I became aware of the clothespin vise when I was demonstrating one of my other vises at a show. A visitor to my tying station related that while my vise was simple, he had used an even more simple vise when teaching a fly tying class to youth. I still remember him telling me that all of the youngsters had great fun with their clothespin vises. I don’t doubt it for one second. All clothespins are not created equal. Before you start to build your vise, experiment with the clothespins you have selected. Is it made with a hard wood? What are its dimensions? 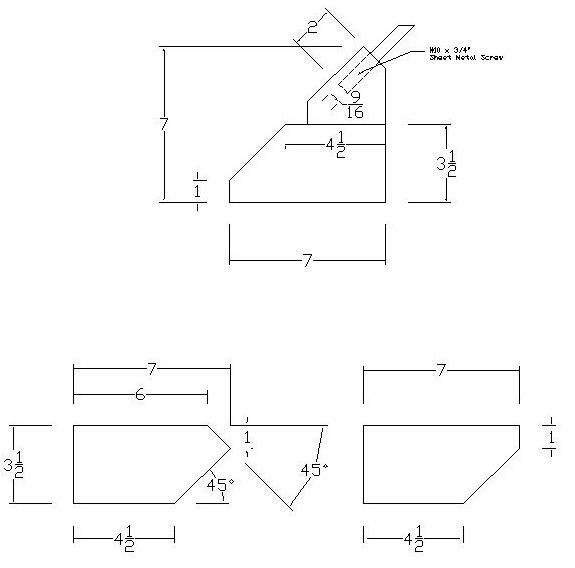 Is the hole diameter and depth shown on the drawings below, too large or too small for the clothespin you have selected? Would a ½ inch dowel work just as well or perhaps better? If you use a dowel, plan your cut for the slot (that forms the two jaws), so that the wood grain runs parallel to the direction of the hook. The plans below are offered as a guide. You may desire to adapt them. I have been building low-budget vises for about ten years now. The reason I present more than one vise is that the tools and skills required to build each one vary. There is a trade-off with each vise. Generally speaking, vises that take more skills and equipment to build have features that make them easier to use. The ease of operation of some of these may fit your personal style more than others. It is my hope that individuals select a vise that matches the tools and building skills they have. It is also my hope that individuals who first build their own, may decide to make up kits that youth may assemble as part of a fly tying class or project. Consider the end result, you will make fly tying accessible to youth that are often shut out by the cost of a “good vise”. To me a “good vise” is a vise that an individual uses to create a fly that will land a fish.